Well this sure has been an interesting week. AGD Europe has been swamped with phone calls and we are scrambling to figure out pricing and delivery. Just to add to the mad confusion I have to show you guys one more feature on the 2x Grip you hadn't seen before. 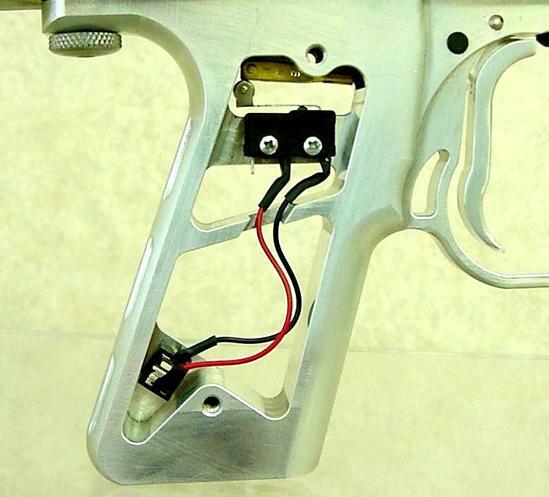 As part of the stock machined frame we are including mounts for a micro-switch that is activated when pulling the trigger. The switch is hooked to a phone plug jack that also has a mount machined into the frame. Both the switch and phone plug are stock Radio Shack parts and cost about 4 bucks. This means you can Warp Interface or Intelifeed your mechanical gun with a minimum of problems. We originally did this with our prototype Auto-response Trigger to keep balls in the gun in 1992. 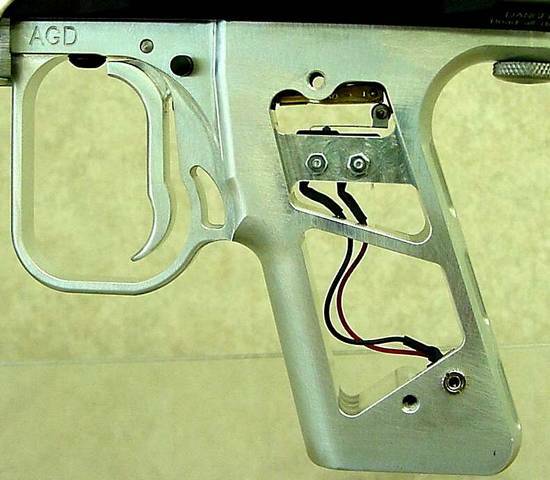 The plug in the side of the grip makes it very convenient to disassemble.